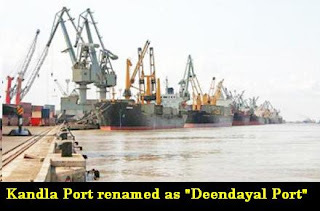 Kandla Port, one of the top 12 major ports in the country, has been rechristened as Deendayal Port from Monday in the name of Hindutva icon pandit Deendayal Upadhyay. “Kandla Port Trust is renamed as Deendayal Port Trust with effect from 25 September 2017,” the government said on 25th September 2017. Kandla Port, located on the Gulf of Kutch in Gujarat, is one of the twelve major ports in the country. As per the Ministry’s notification, the Central Government, in exercise of powers conferred on it under Indian Ports Act, 1908, made the amendment to replace “Kandla” with “Deendayal”.